[Ballmer: No on WebKit, yes on app store Latest Microsoft News - CNET News](http://news.cnet.com/8301-10805_3-10090118-75.html?part=rss&subj=news&tag=2547-1_3-0-5) - Despite acknowledging that WebKit’s open-source nature is “interesting,” Microsoft’s chief executive elaborated on why he says the software giant is sticking–at least for now–with its Trident rendering engine for Internet Explorer. Annoyances.org - Default Folder Template Patch – This is such an annoying feature of Vista that I have to post it again. Please Windows 7, don’t do this. Shut Down Windows Vista Quickly via Sleep Button – Change the default behavior of the power button. Andy Hopper’s Blog : Announcing NTrace v1.0 - NTrace is a combination of a runtime library and a preprocessor that enables you to incorporate the same kind of tracing flexibility and performance that was previously only available to the lucky folks still writing unmanaged code. Dilbert comic strip for 11/09/2008 from the official Dilbert comic strips archive – It’s funny because it’s so true! Microsoft eyes Visual Studio advancements – The next version of Visual Studio will sport a WPF version of the text editor. Should make for some interesting enhancements. TeamPlayer Enables Multiple Input Devices - Windows only: TeamPlayer allows you to use multiple mice and keyboards on a Windows based system. Under normal circumstances you can plug multiple USB mice in, but moving the two simultaneously will result in Windows struggling to decide which input to use for the single cursor on the screen. TeamPlayer is designed for a group environment where multiple people will be interacting with the same computer. Each mouse is assigned a unique colored cursor to identify it. Revolutionary auto already on the road – Dean Karmen (inventor of the Segway) shows off the his newest invention – a Stirling hybrid electric car. Sara Ford’s WebLog : Did you know… - You can press Ctrl+\, D to view the Code Definition Window. Try this one, it’s better than you think. 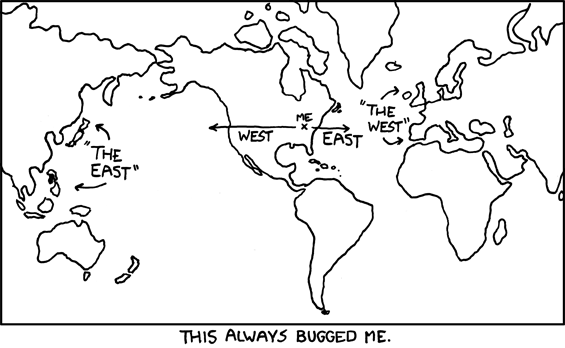 xkcd - A Webcomic – Terminology – He’s not the only one. Download the Jarte Word Processor - noun (est. 2001) 1. A free word processor based on the Microsoft WordPad word processing engine built into Windows. 2. A fast starting, easy to use word processor that expands well beyond the WordPad feature set. 3. A small, portable word processor whose documents are fully compatible with Word and WordPad. I like it. Solution: Installing Win SDK after VS2008 breaks XAML Intellisense – Here’s a quick fix if Intellisense for XAML stops working in Visual Studio 2008. TUTORIAL #9: Embedding Fonts In Silverlight 2 – Short and sweet. Just what a tutorial should be. TytanNET - Visual Studio Great Add-in – I downloaded last night. Can’t say if it’s a keeper yet. It did install cleanly and does not slow down my IDE like Resharper or CodeRush. KLS SOFT - WSCC - Windows System Control Center - WSCC is a free, portable program that allows you to view, execute and organize the utilities from various system utility suites. It’s basically a front end for sysinternals but useful non-the-less. The Associated Press: Images captured of 4 planets outside solar system – Unlike earlier discoveries that detected planets indirectly, this discovery is an actual image. [FileForum Safari for Windows](http://fileforum.betanews.com/detail/Safari_for_Windows/1042667790/2) – Latest update fixes 11 security issues. Sure wish they would add some features. Breaking changes to the String class – .Net 4.0 string compares will be culture invariant. Earlier versions used the current culture. Comparisons will be faster but then again they may be wrong depending on what you’re expecting. Good reason to be explicit when doing string compares.